The secret to writing a dynamite novel is to first write a dynamite scene. Because if you can write one terrific scene, you can write a hundred. And that's a novel. 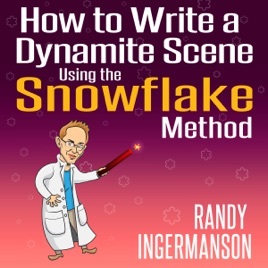 How to Write a Dynamite Scene Using the Snowflake Method will give you the power tools you need to write scenes that move your reader's emotions. The one thing your reader most desperately wants. And why. How to decide which character should have the point of view. The two kinds of scenes designed to give your reader a powerful emotional experience - and how to know which to use. Five ways to test that your lead character's goal in each scene is perfect. How to end every scene so it leaves your reader wanting more. Why dilemmas are good, and how to know when they're ruining your story. Four ways to know that your character's decision will drive your story forward. How to know when a scene is broken - and how to fix it.